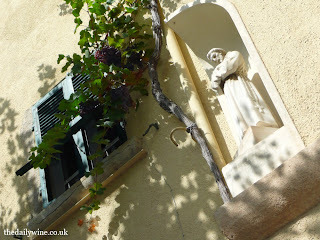 Pictured: A vine wants to climb - Romans once trained grapevines up trees leading up to a dangerous harvest. 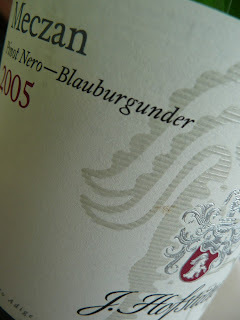 From the foothills of the Dolomites comes a classy '05 'Blauburguner' (AKA Pinot Nero or Pinot Noir) from Hofstatter: Meczan. With a relaxed nose and a mellow mouthfeel, this wine is far from sullen. A spreading, not unpleasantly difficult to define palate (meaning a conveyor of contemplative sips were applied in rapid succession) with food friendly, subtly penetrating acidity and a gentle, warming, almost caressing reach. It is a being which knows its genre. Relaxed in its own skin. Couthly packaged too. In my way this article beats other Alto Adige Pinot Producer, Franz Haas, by some way with its coherence and drinkability.